forwarder: Allows creating aliases, when it received an email alias, will be sent to the address declared. autoresponder: Create 1 auto responder email when a new email received from customers. Email filters allow users to arbitrarily adjust stopping junk mail, or just do not want to receive mail address. Make sure you have 01 domains (Domain) and Hosting service providers prior to initialization Email. – Enter the address of the form: www.yourdomain.com:2222. – In the Username box, enter your username information by the hosting service provider has assigned you. – In the Password field, enter password information. 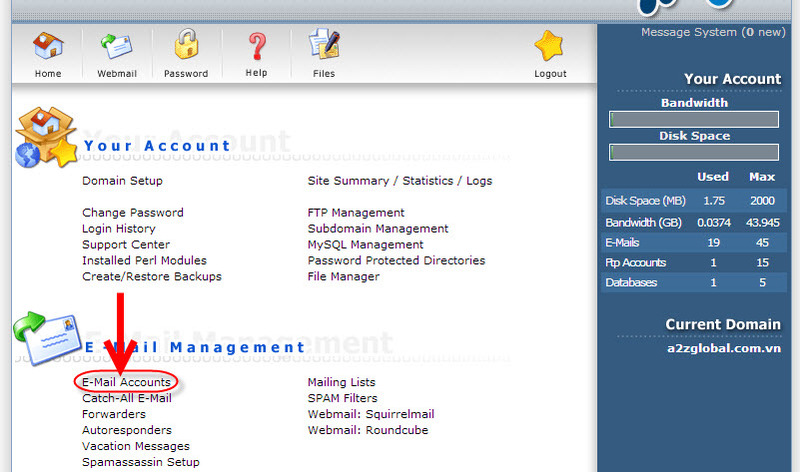 Step 4: In the dialog box in Figure 3, please click the Create mail account select screen appears. Then please fill out the information you want to create, then click Create . Finally you created an email account .